Grand Master Vohra's academy hosts regular special martial arts seminars to members and non-members alike. These will take place over the course of a weekend each and will introduce the participants to different aspects of the martial arts from self defence to inner energy. 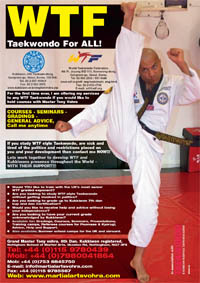 Each course will be taken by an international Master or Grand Master instructor. All are welcome to take these seminars from beginner to black belt as you do not need to have a martial arts background to benefit from the tuition being offered. 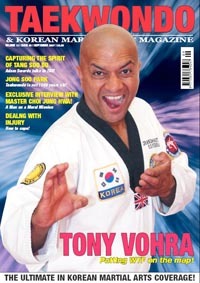 The International School of Martial Arts UK HQ has a dynamic Demonstration Team who are available to demonstrate Jumping, Flying, Kicking, Destruction and Self Defence. This may enhance your event as it has already done for Round Table, Charity Events, Fetes, Galas, Martial Arts events etc. Grandmaster Vohra is available to conduct gradings for colour belts and Black Belt Dan grades up to 6th Dan in the United Kingdom and outside. He would welcome the opportunity to discuss any requirements you may have. 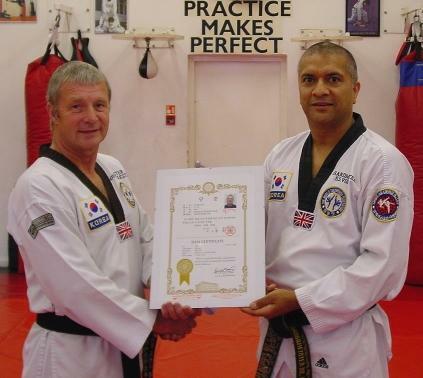 Grandmaster Vohra presenting Donald Theakestone with his 6th Dan Kukkiwon World Taekwondo Headquarters certification issued on 05 May 2006 by Kukkiwon President Woon Kyu Uhm. Theakstone has been training with GM Vohra since December 1982.